Purchased from Mrs M K Neave in 1930. The house was bought from Mrs Neave of Cotham, Newark-on-Trent, in 1930. It dates from about 1840 but little is known about its origin. It is a snapshot of an early Victorian interior. Of particular interest is the nursery which, by this time, is a more comfortable, much less formal room than before, where a new mother would receive visitors to the new-born baby in some comfort as well as style. The exterior has pointed Gothic windows, an unusual feature in a dolls' house. The rooms are badly proportioned, and the full scale wallpaper and carpets emphasize this. Nonetheless the house conveys an atmosphere of undisturbed early Victorian domestic idyll. 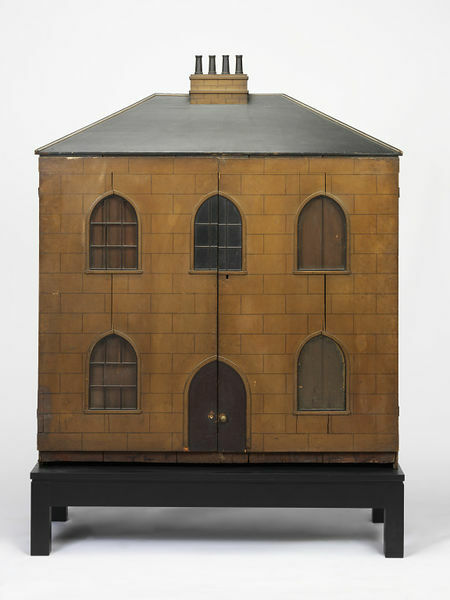 Dolls' house made of painted wood with four rooms. The hipped roof has a moulded chimney stack with four chimney pots in the centre. The facade, painted buff in imitation of stonework has three arched windows above (one a dummy) and two below, all glazed and divided by bars. There is an arched doorway and the door is painted brown with two brass handles. On the upper floor is a bedroom and drawing room; on the lower a dining room and kitchen. 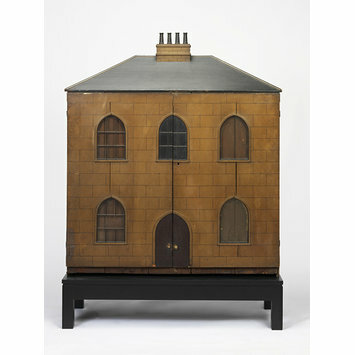 The rooms are papered and contain a large number of pieces of miniature furniture, figures and other small accessories. Three of the floors are carpeted and there are curtains in the upper rooms. The house and contents were purchased for £30 from Mrs Margaret Kirkby Neave, nee Riggall, in 1930. Margaret was born in 1871, the daughter of a landowning farmer in Lincolnshire.